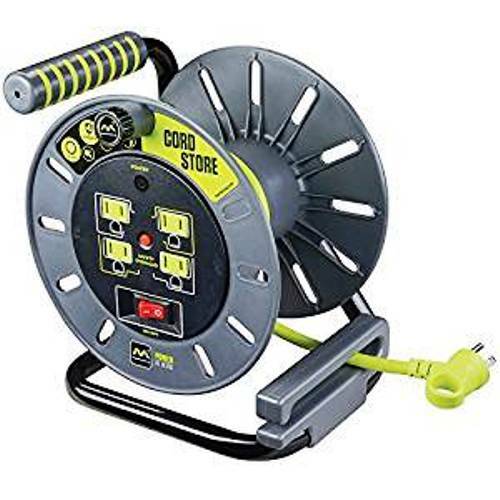 Masterplug's easy-use Storage Reel is perfect for use in workshops, homes, yards, and light industrial applications. No more tangled electrical cords. If you are tired of hand coiling cable only for it to become a mess anyway, a cable reel is a perfect solution. Use the reel anywhere in the home just by unspooling and plugging it in. When you are finished all you have to do is wind the reel to keep your cord neat, accessible, and easy to store. Four surge protected outlets ensure you have power where you need it. Masterplug's reels are backed by our three year warranty and our customer support team, located in Houston, Texas, is ready to help you, Monday through Friday.